Your body uses carbohydrates as its main source of energy. The 2010 Dietary Guidelines for Americans, provided by the U.S. Department of Agriculture and the U.S. Department of Health and Human Services, recommend keeping your carbohydrate intake between 45 and 65 percent of your daily calories. Consuming too many carbohydrates or too much of the wrong type of carbohydrates leads to health problems. Simple carbohydrates, such as those found in candy, cookies, crackers, some fruits and vegetables, soft drinks, energy drinks and fruit drinks, cause rapid spikes in your blood sugar levels. A rapid spike in blood sugar often results in an energy crash within an hour or two, warns Sharon Richter, a certified dietetic nutritionist in New York City. If you eat simple carbohydrates, pair them with a food high in protein or fiber, Richter continues. Protein and fiber slow the digestion of the carbohydrates and limit the spike in your blood sugar levels. Diets containing large amounts of carbohydrates are associated with obesity and increased caloric intake. In the February 2004 issue of "Morbidity and Mortality Weekly Report" from the Centers of Disease Control and Prevention, a survey found that between the years 1971 and 2000 the daily intake of calories increased by around 22 percent for women and around 7 percent for men. Carbohydrate intake is the main cause of this increase. The consumption of food away from home, salty snacks, soft drinks and pizza contribute to this increase in carbohydrate calories. 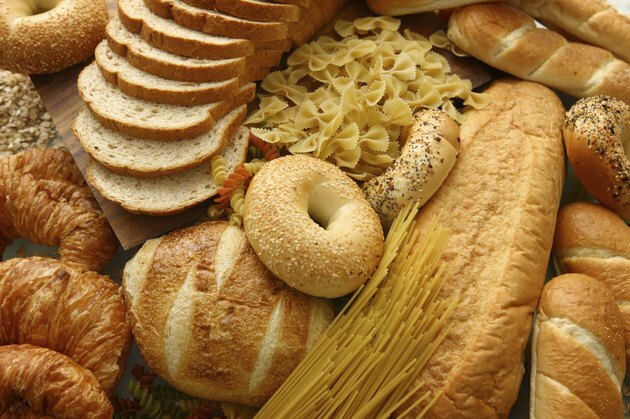 Carbohydrate intake may increase the amount of gastrointestinal distress you experience. The National Digestive Diseases Information Clearinghouse reports that the digestion of carbohydrates causes gas more than any other type of food, including fat. As gas builds up in the digestive tract, you may experience abdominal discomfort, belching, bloating and flatulence. Added sugars, including sugars and syrups added during food processing and those you add to food before consumption, may increase cholesterol levels. The August 2009 issue of "Circulation," a journal published by the American Heart Association, reports that high triglyceride levels often result from diets high in fructose, glucose and sucrose. Triglycerides are a form of cholesterol that attributes to plaque buildup in your arteries, which is associated with an increased risk of heart attack and stroke. A diet containing a lot of sugary snacks, chips, refined grains and high-calorie drinks typically contains too many carbohydrates. The 2010 Dietary Guidelines for Americans recommends consuming more naturally occurring carbohydrates that contain high amounts of fiber, such as whole grains, vegetables, lentils and fruits, while limiting your intake of processed foods with added sugars. High-fiber foods help fill you up faster and keep you full longer to help eliminate your desire for high-carbohydrate snacks and overeating during meals. Try eliminating liquid calories in the form of soft drinks, fruit-flavored drinks and energy drinks to eliminate even more carbohydrates from your diet.